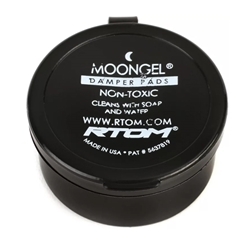 Moongel is a non-toxic self-adhesive gel that sticks to drum heads, cymbals, and most percussion equipment, giving you a flexible dampening solution for your drum gear. Move the Moongel MG4 around the drum head and cymbal until you find and impede the offending frequencies. Moongel is washable and retains its stickiness, giving you years of service.